Most people do not like to think about what would happen if they were to become mentally or physically incapacitated. Many estate planning attorneys encourage their clients to sign a durable power of attorney document to prepare for a worst-case scenario. A power of attorney gives someone, usually a spouse, a trusted friend, or family member, the power to make decisions on your behalf in the event you can no longer make decisions for yourself. A “durable” power of attorney means that the power of attorney will still be valid if you become incapacitated. At San Diego Esquire, we provide affordable estate planning services to California residents. 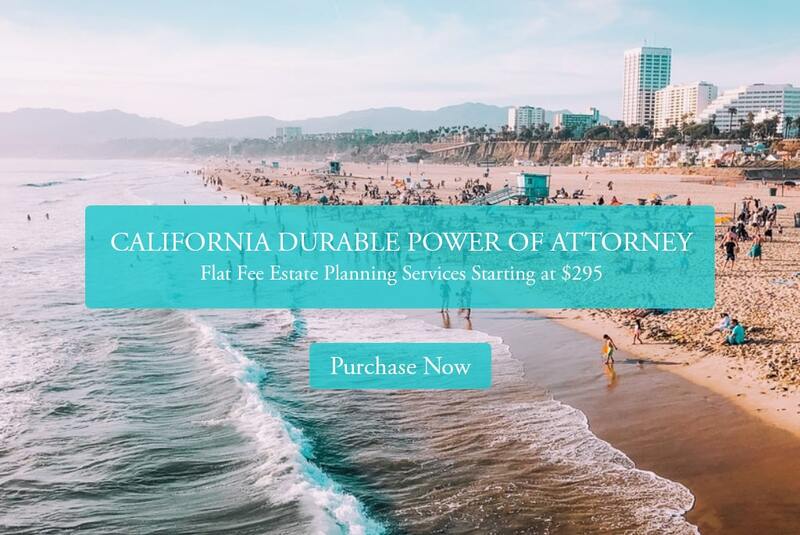 We can help you prepare an California durable power of attorney for as low as $295. Sign up on our website today to begin the process. There are two main types of durable powers of attorney: financial and medical. An agent with financial power of attorney can access your bank accounts, sell or transfer your property, operate your business, collect retirement benefits, and pay bills and taxes. A financial power of attorney can include specific terms. For example, a person may indicate that a fixed amount must go to charity, or it can include terms directing money to be put into an IRA or a college saving account. An agent is legally required to act in your best interest, but there have been instances of agents abusing their power and stealing assets. For this reason, you should be careful with your choice of financial power of attorney and make sure it is someone you completely trust. The second type of durable power of attorney is a medical power of attorney. A person with medical power of attorney has the authority to make critical decisions about your medical treatments and health care if you are too injured or sick to make them for yourself. The person you appoint as medical power of attorney should be familiar with your values and preferences for medical treatments. A person can designate the same person to have both financial and medical power of attorney, but this is not always the best case. Conflicts of interest may arise if someone is responsible for both financial and medical decisions. The advantage of creating a durable power of attorney is that if you do become incapacitated, your family does not need to go to court to obtain a guardianship or conservatorship to pay you bills. Obtaining guardianship is a stressful and potentially expensive and contentious court proceeding. A guardian is required to make annual reports to the court, which is not required of someone appointed power of attorney. Furthermore, court proceedings become public records, meaning embarrassing medical histories may be exposed to the world. A power of attorney become effective immediately when signed. If you do not want the power of attorney to be immediately effective, you should create a springing power of attorney, which only will become effective when you become incapacitated, and will be ineffective if you become competent again. There are several ways a durable power of attorney may be cancelled. A durable power of attorney is revocable, and you can cancel it anytime if you are of sound mind. A durable power of attorney may have an expiration date. In some states, a power of attorney that names a spouse as an agent terminates in the event of a divorce. A durable power of attorney also will terminate if the named agent cannot be located. For these reasons, it is important to name alternate agents. Lastly a power of attorney is automatically terminated upon death. An agent can only make decisions on behalf of a living person. Many attorneys will create a power of attorney along side a will or other estate planning document. Laws regarding durable power of attorney vary from state to state. Some states require a signature from the agent granted power of attorney. In some states, a durable power of attorney has a statutory expiration date. Some states require one signature while others require two. This is important to keep in mind if you move to a different state. A power of attorney form that was valid upon creation may not conform with your new state’s requirements, and thus become invalid upon moving. If you move overseas, a power of attorney created in the U.S. will probably be void. If you do create a durable power of attorney, you should revisit and resign the document annually to ensure validity.